Joyful Work, Delicious Food and Strong Community. What is the Blue Scorcher?? 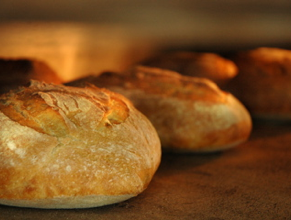 We create artisan breads, pastries and handcrafted seasonal foods using local and organic ingredients. We operate as a worker collective. Our coffee drinks are made with locally roasted Astoria Coffee Roaster organic fair trade coffee and Organic Valley Farms organic milk. We have a wide selection of magazines and periodicals available for purchase, including the Sunday New York Times. Our children’s area featuring a play kitchen, natural dyed playsilks and a wide array of children’s books. We are a popular place for families, especially during the winter rains. We are located in beautiful Astoria, Oregon. On the east side of downtown on the corner of 15th and Duane Streets in the Historic Fort George building. Our huge windows look out to the Columbia River. The bakery is built on the site of the original Fort of Astoria which is commemorated by a sweet little park- perfect for picnics. We have chosen to provide deli style service, as it facilitates our aim to be a community gathering place. Ordering occurs at the counter, we deliver your food to your table. Let us know if you need additional assistance for any reason. Gluten Free Fridays are up and running featuring more gluten free pastries, and lunch specials to warm your belly. early birds welcome, as are late bread sales.